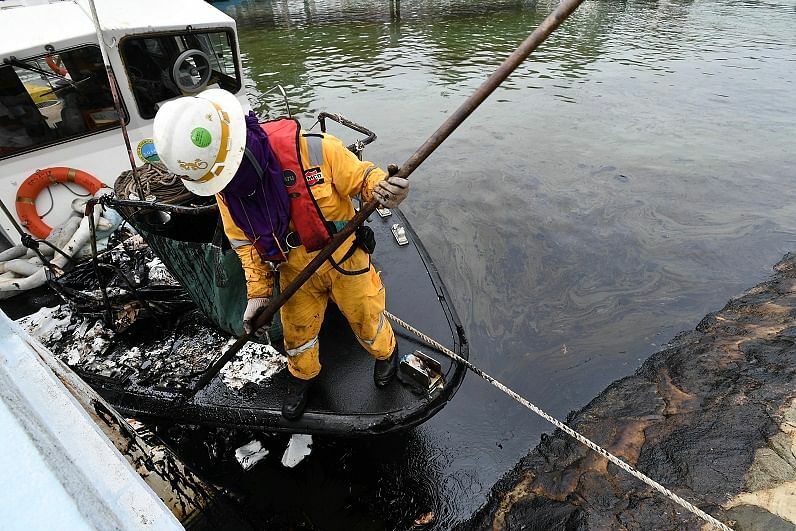 SINGAPORE - The oil spill that occurred in Johor on Tuesday (Jan 3) night following a collision between two vessels has reached the shores of mainland Singapore. Parks along the north-eastern coast of Singapore, including Changi Beach Park, were affected, with black oil stains spotted on the beach and in the shallows. On Thursday (Jan 5) morning, National Environment Agency (NEA) contractors were seen bringing up oil absorbents stained with oil onto a vessel while workers packed oil stained sand into trash bags. Workers were also seen putting up sign boards advising people to stay away from the contaminated waters and that the beach was closed. NEA said that an affected 800m stretch of Changi Beach has been closed to beachgoers until further notice as the cleanup is ongoing. 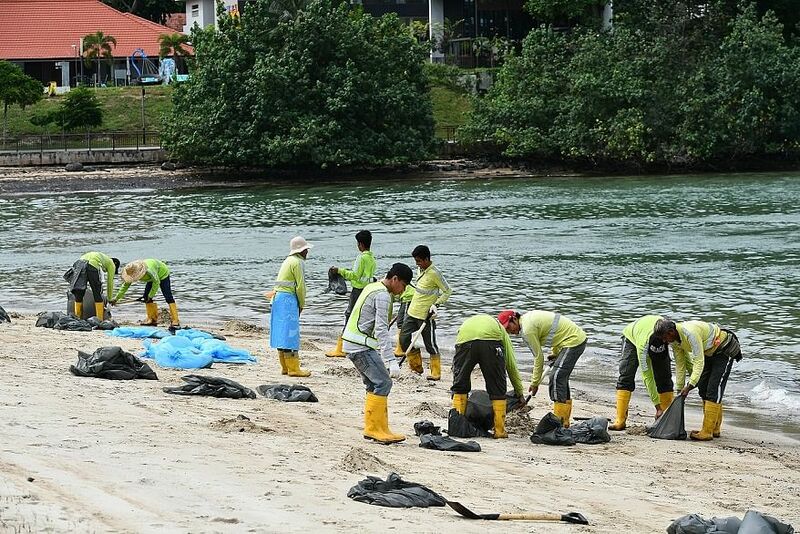 A 100m stretch at Noordin Beach at Pulau Ubin has also been affected and is being cleaned. Punggol Beach and Pasir Ris Beach were also affected, but cleaning operations were completed. "Members of the public are advised to exercise caution when visiting these beaches and to avoid the affected stretches where cleaning operations are still ongoing," NEA said. Some patches of oil were spotted off the Changi Airport fuel hydrant installation jetty along Nicoll Drive, and also along the shorelines of Changi Point Ferry Terminal and Changi Sailing Club in the early hours of the morning, the Maritime and Port Authority (MPA) said. A total of 17 vessels and 222 personnel have been deployed in the clean up, MPA added. Oil spill response vessels, containment booms and spill recovery equipment such as harbour busters and skimmers have also been deployed at the affected areas. Port operations remain unaffected, MPA said. A check at the beach near Downtown East - a popular spot next to E Hub shopping mall - showed the waters there were clear. The collision between the two vessels happened off Pasir Gudang Port in Johor on Tuesday night. The incident occurred close to midnight and left 300 tonnes of oil spillage as a result of damage to one of the vessel's bunker tanks. Besides animals, oil spills also affect trees. Mangrove trees, in particular, breathe through pores in their trunks and stilt roots, which can get clogged by oil. Mr Stephen Beng, head of the Nature Society Singapore's marine conservation group, told The Straits Times that oil spills devastate the marine environment. "Surface oil has direct contact with intertidal coral which kills them. Deeper lying corals are impacted by lighter oil components which mix easily with the water and are often the most toxic. Heavier oils bond with sediments and often get heavy enough to sink and smother corals," he said, noting also that mangrove habitats could be adversely affected by such spills. Pulau Ubin is home to the largest patches of mangroves in Singapore. Members of the public who spot any oil patches in Singapore waters or coastline can contact MPA's 24-hour Marine Safety Control Centre at 6325-2488/9.